A warehouse operation consists of two elements; the amount of each product stocked and the position of each item. The former ‘s aim is to provide the right amount of stock at the right time and there are tools to do this, often coming under the heading of ‘Stock Control’ and these can calculate ‘Minimum Stock’ before it is time to re-order the stock. These take into account the rate at which the stock can be replenished and the rate at which it is used. We can help with making inventory polices to optimise your inventory management. However, there is another side to the Warehouse operation that is rarely optimised and that is WHERE in the warehouse we should put the stock to optimise the time it takes to pick & pack the stock. 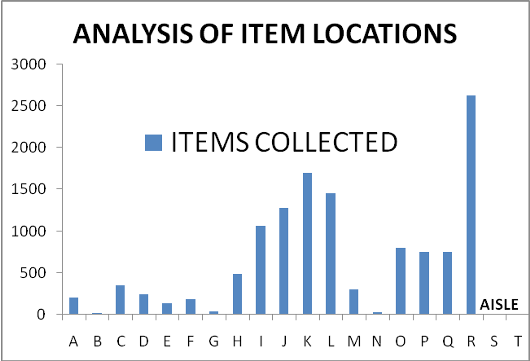 The graph shows a typical picking pattern where some 12,000 items on 700 picklists over a 24-hour period were located and taken to the packing area. It shows the warehouse has 20 aisles. If the packing area was to the left, or right, or in line with the aisles there would be very different costs associated with the picking. As the packing area and aisles are fixed locations then the real variable is to organise the stock location instead. By analysing the way the ware house is organised, we can reduce the operating costs substantially. Then goods are located in proportion to their usage rates and picking times to minimise the operation costs. Warehouse staffing is a little analysed event. A proper analysis will determine how many staff are required and at what times of the day, from which we will set up the best shift pattern. Very often the work load in a warehouse is a seasonal activity; it will usually vary through the week anyway. Thus a shift pattern appropriate to the workload is essential on a weekly basis. The solutions for variations over long periods can include the use of Annualised Hours and/or Agency Workers to optimise the operation when the workload varies over the year.